Top left :Metabolism and Mortality/O2, post-firing state / right: Greenhouse, 8’ dia., steel, thermometers, glass / center: rement, beech tree / right: Furnace, 9' h. x 12' w., steel, refractory cement, beech branches / Tyler School of Art / Elkins Park, PA / 1992. Top right: Rotting Flame II / 360+ oranges on steel armature, wall, 12 ft. (3.7 m) h . x 15 ft. (4.8 m) l., 2009 / Adventures of the Fire, The 5th World Ceramic Biennale Korea, Icheon World Ceramic Center, Icheon, Korea – April 25-June 24, 2009. Bottom: If the Sea were Gasoline - It Would Still be Nature / inkjet print on drafting film / two panels / 40 in x 144 in. / 2006-08 / Felsic/Mafic/Carbonate Facies group. Top: Pitzer Project: a Prototype System for the Production and Distribution of Ancient Sunlight / 14 ft. x 17 ft., gasoline generator/flue with computerized timer, electrical conduit, commercial light pole, concrete foundation, Pitzer College, Claremont, CA, 1996. Top: Study: Watt's Engine/Street Light/Coal Mine / computer study for environmental work / dimensions variable / 2004-present. 51 Million BTU’s/ Metabolism Study/C3H8, e-, NaCl, is a video installation engaged with the transformation of energy expended in a group of site-process works of the late 1980’s. Using the projection of video on a rock-salt-surfaced screen, 51 Million BTU’s/ Metabolism Study/C3H8, e-, NaCl, visually and metaphorically expatiates upon scientific ideas initiated in the site projects about the ancient solar origin of fossil fuels. These concepts briefly state that Mesozoic-Cenozoic sunlight shining on ancient forests and mats of algae floating on ancient seas was transformed along with atmospheric CO2 by photosynthesis into energy laden organic materials. These materials were later deposited and further transformed by geologic processes into what are now called fossil fuels. The ignition and transformation of fossil fuels in the site projects releases the stored ancient sunlight in the form of radiant energy. 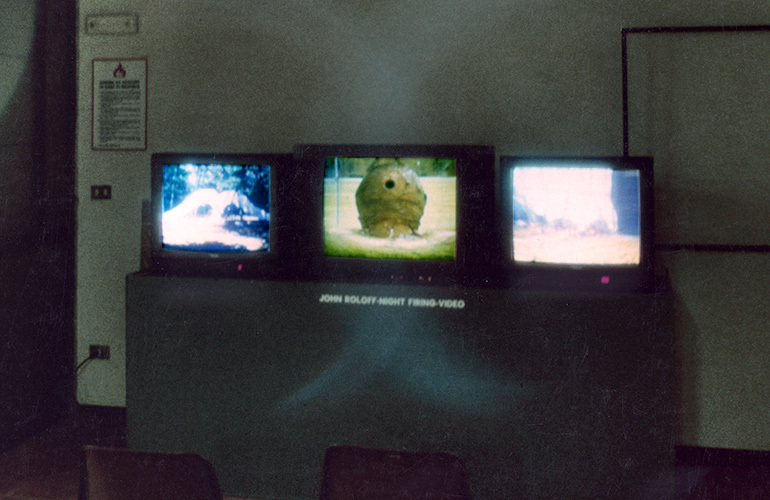 The environmental furnace works captured on the video are Untitled (Earth Orchid), 1988, Oculus: Dead Sea/Oil Field, 1989, and Humboldt Ship, 1989. These are grouped under the title of “51 Million BTU’s” (British Thermal Unit, is a scientific term for the measurement of energy) which is the total calculated energy expended in the firing of these projects. This series in itself makes an initial exploration through form, image and process of the solar/botanical/geologic origin of fossil fuels and the transformative energy released by their ignition. As an example, Untitled (Earth Orchid) examines botanical form by the ignition of natural gas into radiant energy within the central core of a furnace shaped to resemble the cross-section of an abstract orchid. In a prototype version of 51 Million BTU’s/ Metabolism Study/C3H8, e-, NaCl, 1991-1993, a single three-tube video projector was used to project an interwoven sequence of the furnace firings onto the rock salt screen. The salt crystal screen references the generally marine environment in which botanic materials were originally deposited. The crystals also act as prisms to diffract the projected video image breaking down its visual structure. The projected images underwent a moderate degree of transformation towards sunlight, still retaining some of their form. A further version of the project proposes using three, 3-tube video projectors also projecting onto a heavily rock salt encrusted screen to completely transform the projected image into a intense undifferentiated light reminiscent of sunlight. 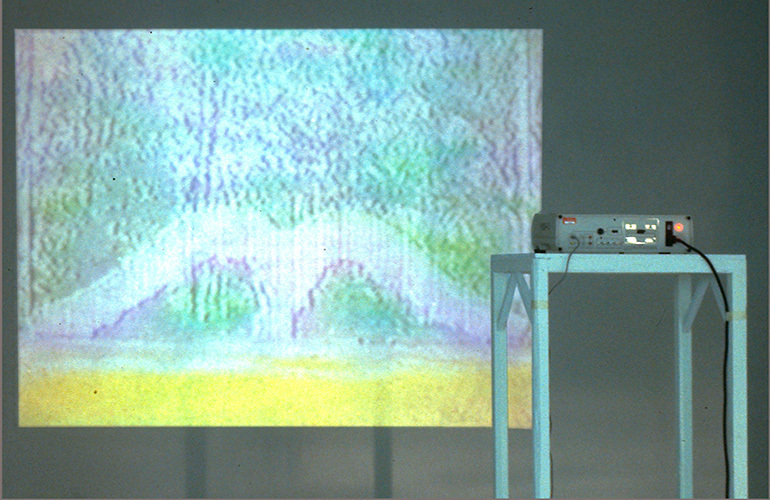 Simultaneous sound and image of non-diffracted video would be seen on adjacent monitors so the viewer can see the degree of transformation taking place. The concepts explored in 51 Million BTU’s/ Metabolism Study/C3H8, e-, NaCl, have been also examined on site in other works, such as (also shown above): Metabolism and Mortality/O2, 1992, Tyler School of Art, Elkins Park, PA and Pitzer Project: A Prototype System for the Production and Redistribution of Ancient Sunlight, 1996, Pitzer College, Claremont, CA.